Wow! Things are growing despite all the hot weather. We have had lots of ‘community garden tourists’ complimenting all the gardeners on their hard work!! There are some pretty incredible gardens going in this year! You will have noticed snow fencing on the west end of the garden. That is the beginning of the protective measures the Cedar Falls Parks and Recreation Department and the Sturgis Falls Festival Committee are taking to provide protection for the gardens from parked cars and walkers during the festival Be sure to tell them thank you!! Reminder, the weeds need to be managed and doing it now will make it easier to manage the rest of the year. We ask that weeds be removed before they reach 6 inches or start to go to seed. This includes squash patches as well as row gardens. And watch the edges and keep them hoed as well so the mower can get as close as possible to the tilled areas of your garden. That saves everyone a lot of work. So far this years, it’s looking pretty good!! We mentioned this in the last update and on Facebook, but we ask that all plots be cleaned up and planted by June 15th. This allows the committee to manage any unwanted plots with less work and potential impact on the neighboring gardens. In the same spirit, we will close registration/payment for plots on June 15th as well. The gardening year has started out with a heat wave but gardeners have had some success already. 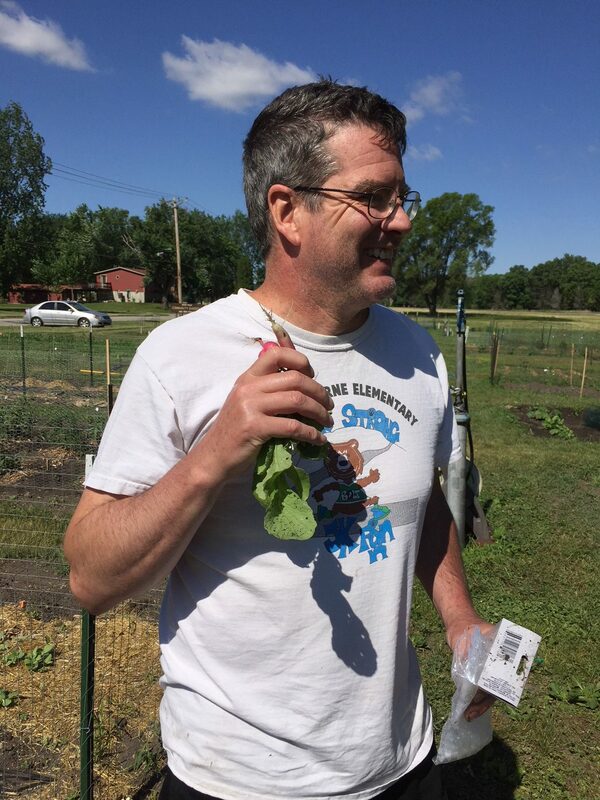 Jim shows off his radishes grown from seeds he planted in early May. 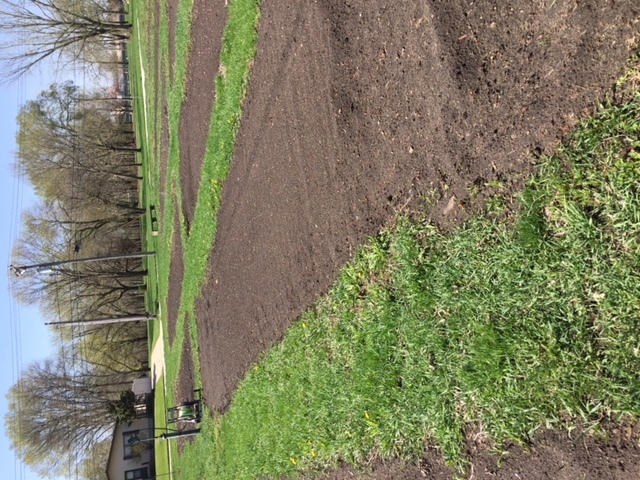 We are asking that everyone get their garden plots started by June 15th. 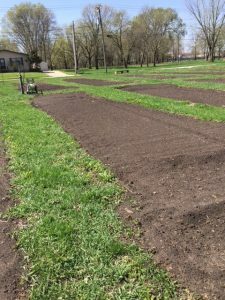 The City tilled the first days of May so if you have not worked your plot yet, you will have some weeds and grasses to clear. After several years of neglect, the new garden committee last year enforced the garden rules on weed control and one committee member did the mowing to make sure it was kept up. It will take several years for all the weed and grass seeds to work out of the plots but it’s better this year. Last year we solarized some of the plots (but not all) and even those plots are showing grass growth. 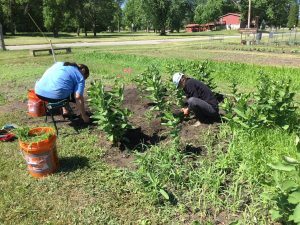 We set aside a plot covered with milkweed as a reserve. Over the weekend, gardeners chipped in and weeded the grasses. They found several caterpillars already and encourage other gardeners to check out our little butterfly haven!. Feel free to pull a weed if you see one while looking! 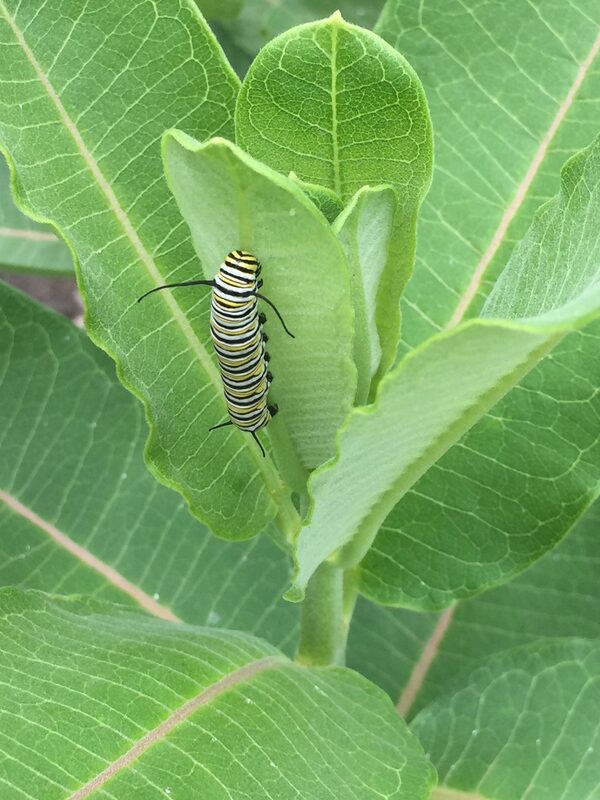 Several gardeners have discovered milkweed in their plots as well and are just gardening around them, Kudos!! At both ends of the gardens, you will see flower gardens planted by the committee to attract pollinators to the area. One gardener sent in a soil sample collected from several plots. The results came back low in nitrogen but high in phosphorus. Gardeners may want to look for plant fertilizer with lots of nitrogen and lower in other areas. You can check with Iowa State Extension for additional ideas. Gardens are starting to go in. Exciting! The tilling was deeper this year but because the City uses large equipment, the edges are messy. Using your hoes, rakes and shovels to even out and clean up the edges will help the garden mower get closer to your garden edges and reduce the weeds sneaking in that you will have to pull to maintain clean edges. Win Win for both!! Reminder. When you find rocks in your plot, carry them to the base of the trees. DO NOT leave them in the pathways. We had to buy a new mower this year because of rock damage to the current one. Also, remember that we have asked that any bird netting or other plastic/nylon crop covers be firmly anchored at least 15 inches above ground level to protect the mower. Metal fences need to be set in 4 or 5 inches from the tilled edge. Tunnel covers need to be set back 6 inches from edge of the plot and be sure the strings are pulled in! Replacing equipment yearly will force rent increases in the future. Let’s work together and keep future costs down. It’s for the good of the community! And if you leave tools in the pathways, they’ll be moved to the base of the tree at the east end of the garden. You can reclaim them there. Garden 2018 Update 1 Making Plans? The gardens look lovely. First picture of the year. No weeds…yet And no plants…..yet But we know the gardeners will be flocking out soon and starting the season. Gardens will be open on May 6th. Make your plans now! Each plot is 10 by 20 foot. Several gardeners have rented more than one plot. And all these gardeners are thinking through what they hope to grow and how much they can fit in. 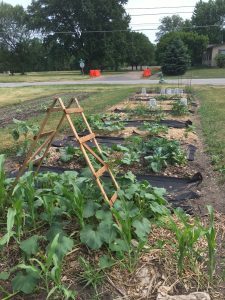 Still thinking about getting a plot for this season? A few plots are still open. Reserve one today. The Cedar Falls Farmers Market also opens this weekend on Saturday from 8:30 to noon at Overman Park. Check them out on Facebook. A number of vendors will be offering vegetable plants for sale. And there will be other delicious and fun things to buy as well. Several local food trucks will be set up for food options. Check it out. The parks department was out to till the gardens this week. They look great and so Sunday the 6th seems as good a day as any to open the gardens. I must add, however, that while they are open, this weather is still an issue. I suspect things will be too wet even through this weekend and, as we all know, one of the last things one wants in gardening is to compact the soil. But–it is everyone’s choice. Plot Assignments are here A few words of explanation. We are gardening from row 10 on the west side to 26 on the east side. 10 and 26 are reserved for flowers. Each row from 11 to 25 is divided into 4 10×20 plots. A and b are on the street or south side and on the north or treed side after the walkway are c and d. We have around 18 gardeners and 40 or so plots rented. That leaves about 18 or so plots open. If you know someone who might be interested, please tell them space is available. They can reserve a plot here. Finally, I will have small flags in place by Sunday morning that have the plot row number and letter and the name of the person renting that plot(s). A few other comments. If you have not done so, please read the garden rules. Last year we were pretty strict about, especially, the issue of plots going to weed. This made a real difference in terms of the weed problems that had almost taken over the gardens. I think another year or two of being tough on the weeds can get us to the point where weeding will be a minor nuisance, not the burden it has been in the recent past. I will be mowing the perimeter and walkways again this year. The City mows the rest for us. I would like all of you, especially if putting up a fence, to place the fence about 4 or 5 inches into the garden plot from the tilled edges. This allows me to mow right up the the fence and mitigate the migration of weeds into your garden area. The weeds cannot be stopped, but they can be discouraged from creeping into and getting entangled in the fence. Also, last year some people used nylon bird netting to cover some crops. I have no problem with that except to ask that the netting be kept at least 15 or so inches off the ground. That stuff tends to come loose and sag to ground level where it is very difficult to see when mowing. Last year the mower grabbed a loose end about 3 or 4 times. It was quite a chore to untangle it from the blades. We will begin taking reservations on March 19th (Monday)for the 2018 gardening season. Each 10 x 20 plot costs the same as last year–$25 for individuals and $12.50 for nonprofit groups. The renting of up to six plots per person/group is no problem. If any person or group would want to rent more than that, for availability reasons, please contact us before doing so. 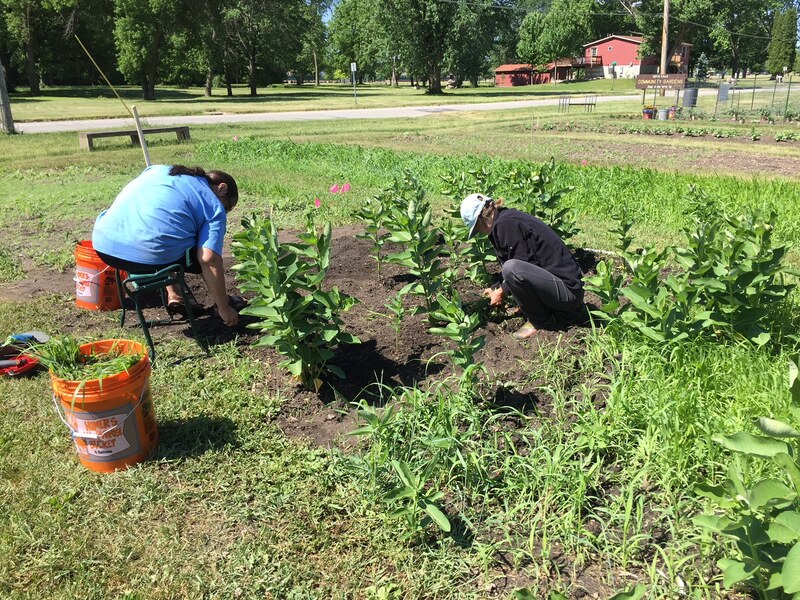 The target date for opening the gardens is May 1, depending of course on the weather and when the parks department can get the tilling done for us. We will announce the definitive opening date as we get closer to May 1. Finally, if you are thinking about joining us, please read the garden tips and the rules that are posted on this web site. We look forward to having as many people as possible garden with us. If anyone has any questions, please contact me at john.smith@cfu.net. The garden will close on October 30th. All fences and plant matter should be removed before that date. The latter can be taken to the city facility just west of the gardens.The sunflowers are an exception. Because they are a good source of food for birds such as finches, they can be left up over the winter. We will remove them in the early spring. It was a good year for gardening with the gardens more weed-free and neatly tended then they have been for years. The garden committee would like to thank all involved for contributing to making this a very enjoyable gardening season. And, for those of you who did not garden this year–think about joining us. There are few things as enjoyable as gardening. A final word. If anyone attempted to contact us during the last few weeks, there was a problem with the contact form. The problem has been fixed, so if you see this message, please retry. We may once again be the victim of a two legged bandit. Our mower spotted a woman he had never seen out at the gardens picking a melon in one patch then moving to another belonging to a different gardener and picking flowers there. She was approached and said her friend was on vacation and had told her to pick what she wanted We checked and the plot owner was NOT on vacation. The car plate and description of car and driver have been reported to the police and they are on the lookout for our bandit. The garden will also receive extra attention from the Cedar Falls Police again since we had another report a day earlier about an unfamiliar man on a dirt bike picking from plots belonging to different people. Keep your eyes peeled and get license plates if you see someone you don’t recognize or traveling through several plots. Meanwhile, the gardens are freshly mowed and looking nice, Lots of tomatoes and peppers though the squash and melon are suffering from the groundhogs, We did put red pepper spray around both dens we have found so far. If anyone has a live trap or knows someone who does, please let us know. The cooler weather the last few weeks has been welcome but it is very dry and we see many of you have been watering when you come out to harvest. Remember when you water, the weeds grow as well as the plants and veggies. Take a minute to clean up in your area when you stop out. As we mentioned in the previous post, our groundhog visitors like the cover of thick and/or tall plantings. Weeds help them as well. After Labor Day, we need to start planning for fall garden cleanup. Take some time to come up with ideas on how we can work together to haul all the debris over to the compost facility and let us know. The City has indicated they would consider a fall tilling if we get everything torn down and cleared out this year.